We answer your questions about how and why CAFOD campaigns and what makes a successful campaign. 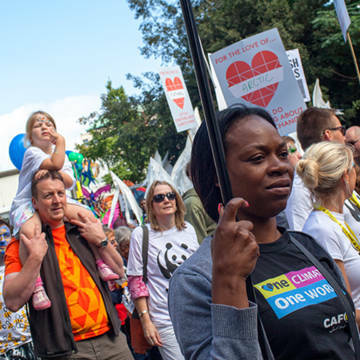 Our campaigning reinforces CAFOD’s relationships with politicians, and enables our research and recommendations to reach the people who have the power to put them into practice. We make a difference when we join our voices with others who feel the same, as part of coalitions including all faiths and none. Fairtrade: CAFOD was one of six organisations that founded the Fairtrade Foundation in 1992. Today, more than 4,500 Fairtrade products are available in the UK, and over 1.3 million farmers worldwide benefit from getting a fair deal for their work. Sainsburys remain the world's largest Fairtrade retailer, but in 2017 they moved to their own 'Fairly Traded' teabags. After strong CAFOD campaigning, they haven't rolled out their Fairly Traded programme to other products. Climate change: Over 900,000 Catholics worldwide lobbied for an ambitious climate deal at the Paris talks in 2015. Over 30,000 Catholics called on the World Bank to shift it's energy spend to renewables as part of our successful Power to be campaign. COP24 in December 2018 saw supporters marching and speaking out on the urgency of the situation, and the need for immediate global change to hit net-zero emissions by 2050. Aid: After decades of campaigning, all major political parties agreed to spend 0.7% of national income on aid. Between 2010 and 2015, UK aid has helped improve nutrition for 28 million children under five and pregnant women. In 2021 it is forecast that the UK will be spending 14.5 million on overseas aid. Debt: CAFOD supporters, as part of the Jubilee 2000 campaign, helped secure over US$110 billion of debt cancellation to the world’s poorest countries. As a result, Ghana, Malawi, Tanzania, Uganda and Zambia could abolish primary school fees. How can I help with CAFOD’s campaigning? Whatever your age, job, wealth or political allegiance, there are many different ways you can speak up alongside people living in poverty, whether or not you call it campaigning. Everyone has something unique to contribute. It’s not just banner-waving, it’s letter-writing, petition-signing, idea-sharing, conversation-starting, email-sending and much more besides. Sign up to our campaign emails to receive the latest news and campaign actions. Become an MP correspondent and write to your MP four times a year. Become a campaign volunteer and tell others about CAFOD’s campaigns. Take our latest action and make your voice heard now. How long has CAFOD been a campaigning organisation? Understanding and acting on the root causes of poverty has been central to CAFOD’s work from the very beginning. It’s part of our calling to be prophetic. CAFOD’s founding mothers spoke out about the injustice which causes people go hungry, as well as encouraging Catholics in England and Wales to respond to the immediate needs of poor communities. Some campaigns take a long time to bear fruit, but we are proud to be part of a campaigning tradition that includes the struggles against apartheid and for equal rights. Influential figures, including Archbishop Desmond Tutu, government ministers and UN climate secretary Christiana Figueres, have paid tribute to CAFOD campaigners. How does CAFOD’s campaigning reflect our Catholic values? We are called to find Christ in [the poor], to lend our voice to their causes, but also to be their friends, to listen to them, to speak for them. We speak out because we are moved by compassion for our neighbours and care for our common home. Our campaigning draws strength from Catholic teaching and from a foundation of prayer and reflection. Campaigning can be a means of putting faith into action. It can change us too, inspiring us to recognise the power we have in our daily lives over the decisions we make about the products we buy, how we use energy or where we invest. The role of the Church and CAFOD is really important. The Church can speak on our behalf. CAFOD can have campaigns, report rights violations, say when things are wrong. You live far away. We are there in the mountains, but you know that we are there. We speak out together with our sisters and brothers living in poverty, listening to their needs and concerns and amplifying their voices. In the UK, we have a voice and a vote, privileges lacked by many around the world. We can use these to stand up against injustice and poverty. 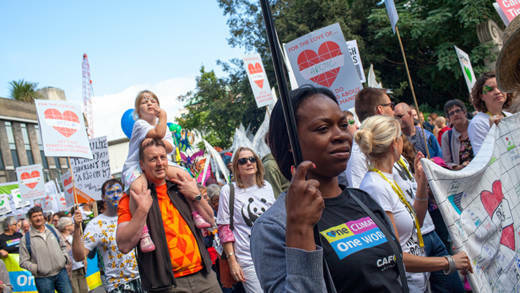 Many of our partner organisations do their own campaigning and advocacy work and are strengthened by knowing that the Catholic community in the UK supports their efforts. How does CAFOD choose what to campaign on? We choose issues which directly affect the communities we work with overseas, and where we believe we can make a difference. Catholic Social Teaching and the teaching of Pope Francis inform what issues we campaign about. In particular, we seek to respond to the call in Laudato Si’ to hear "the cry of the earth and the cry of the poor". We are currently campaigning in solidarity with refugees, for access to energy for poor communities and for action on climate change.